Many Napa Valley vintners are delighted to be finished selling their $50-$150 bottles of 1998 Cabernets and can now move on to showing off their 1999s. Despite the economy being in turmoil, you get the idea that "everything is rosy" in the market for deluxe Cabernets. There is no shortage of triple-digit priced bottles. 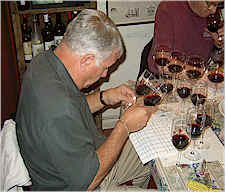 The 1999 vintage is generally held in high regard, especially by Napa Valley vintners. 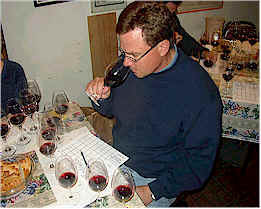 Many wineries view their not increasing the price from their 1998 as some sort of concession to consumers. We assembled a set of what we felt might be potentially interesting wines and put them to the test. Two wines separated themselves from the pack, with one wine lagging well behind. Despite the fact that the slacker was well behind the pack, one might excuse it since it was so much less costly than the rest. The wines, for the most part, were quite good. The relative "value" of these might be debated, especially when one considers the top quality Bordeaux available to consumers for $30-$50. I had seen this wine listed in a price catalogue of a major distributor and thought, "What the heck, it's only $33...Let's try a bottle." While we weren't heart broken over the performance of this wine, we didn't find it to be worth the relatively modest money they're asking for it. One taster described it as "Sulfury and herbaceous like a Chinon (A Cabernet Franc wine from France's Loire Valley), but it's a bit tired and flat-tasting. Vacuous. Really bad." A Cal alum said it reminded her of "Berkeley in the 1970s...lots of grass, man." One participant encountered "Horsy aromas with perfumy currants, violets and milk chocolate and cedar." Another fellow pronounced this to be "Cab Ordinaire." Someone else found "cooked asparagus and baby diapers." Another taster described it as having "the aroma you might find in a horse stable along with sour veggies and cooked cabbage." Gee, I didn't find it especially interesting, but I was that repulsed by the wine! I noted some mild oak notes with a hint of cedar and a fragrance reminiscent of orange peel. As it sat in the glass, I detected an herbal note that veered off into the leathery character one sometimes find in wines plagued by Brettanomyces (a yeast or bacteria). The wine has more tannin and structure than it needs for balance, being less intense and simpler than anything else in the tasting. Modest quality. This winery gained some prominence amongst wine geeks when its 1995 vintage placed first in a major blind-tasting event in San Francisco. 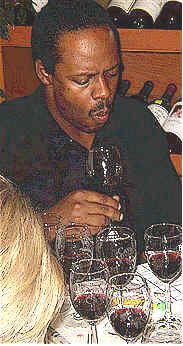 With great expectations for their 1999, one taster described the fragrance as reminiscent of "orange peel." Another person found it to be "cola-like." Someone else said it has "too much oak," a sentiment that caused another person to say the wood contributed a bitter and tannic component on top of the fruit tannins. "It's also got a tutti-frutti quality that I find in some Washington State Cabernets with notes of tobacco and dill...very astringent." Someone else found "earthy fruit notes with mushrooms, cherries, toasty oak but an odd note somewhat like unprocessed milk." One critic said this was more like a barrel sample than a finished, bottled wine. Another person found "tart, leafy notes with some earthiness," while someone else found "Big, ripe tannins and lead pencil and cola notes." I'd have been more positive to this wine except the initial passes through the wine displayed a fragrance I likened to tar or burnt rubber. It was quite unusual. As I became desensitized to it (or it blew off), the nose was more like black licorice. I found the wine to show better on the palate than it did on the nose...I'll have to try this again to make a final assessment. For now, I'm awarding it a one star rating (on a three star scale, no stars being ordinary). This may have 5-10 years of life to it. "It's tightly wound, vegetal with earthy currant fruit and a barn-yard finish." said the lead-off critic. Another person described it as "tannic, but flat and low in acidity." Someone else said it "was soupy and muddled...not really clean on the finish." A fourth person found it had "baked vegetable characteristics and it's basically an empty wine." Someone else said "even though it doesn't exhibit over-ripe or jammy fruit elements, it's a hot wine with noticeable alcohol contributing to the heat." The final word was "Nice nose, sophisticated fragrances with honey and dusty notes but it's not as interesting on the palate." I liked the dark fruit aromas and the mildly oak bouquet. It seemed more refined, being a "kinder, gentler version" of Cabernet. There's a note of tobacco here, too. I pegged it as a Stags Leap District wine, as I usually identify this sort of balance and finesse with wines from that area, most particularly those from our friends the Winiarski's at Stag's Leap Wine Cellars. One-and-a-half stars. "Tart berry notes with some anise, cedar and hints of earth and hints of strawberries" were the adjectives read off by the first critic. Someone else found this to be "Big, spicy and well-balanced." Another critic said "It started nicely but it dropped off quickly. The aromas are terrific but it's not as good on the palate." Someone else found "bark-like notes and a good deal of new oak." One taster found the finish to be too light and other person felt it was a bit overly acidic. I found this to show some mildly cedary notes on the nose, with dark fruits and some woodsy tones. The same qualities are featured on the palate, with black cherry fruit and some nice oak. I suppose it could offer greater intensity, especially given the ambitious price. One star. 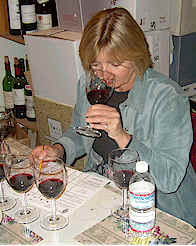 4th Place: MERRYVALE 1999 "PROFILE"
One taster was surprised by the "sharp acidity that had cherry and cranberry juice notes." Another taster agreed with this perspective, saying it's "got a tart edge with dried cherries, some chemical notes and a resiny character." More positively, someone found "Rich and creamy characters here, with mocha and vanilla oak, wood spices and a streak of dried currants." Another taster felt this "has the best balance, with black raspberry fruit and plenty of oak along with balanced tannins and a hint of chili peppers." One critic felt this "lacked fruit," while another person said it lacked "persistence." I found the fragrance of this wine to be sort of "ashy" in character. It reminded me a bit of charred mesquite with the woodsy fragrances here. Nicely balanced on the palate, with a rather charming personality. Lots of dark fruit notes to the flavors with a bit of wood and balanced tannins. One-and-a-half stars. 3rd Place: SIGNORELLO 1999 "PADRONE"
One taster found this to be "Sweet and flowery with some big and hard tannins and lots of vanilla and oak." Another taster agreed with that assessment. Someone else said it was one of the few wines that had a 'clean' character mid-palate. One woman found it to be "very good, with dry herbs on the nose along with some fresh ground black pepper...almost a mole sauce fragrance but not vegetal...mouth-drying tannins, with a nice coffee note to the finish." Another panel member found "Smoky currants and a subtle coffee quality with some herbs and ample toasted oak." Someone else found this to be "full, smooth and it has a long finish." I enjoyed the fragrances here: nice, cedary notes with lots of red and black fruit aromas along with anise/licorice scents. The black fruit notes seem to dominate on the palate, with some cedar notes. Full. Complete. Very good. One-and-a-half to two stars. "Mocha-scented oak with mild chocolate-laced currants, this also shows some cigar box notes." said our lead-off batter. One taster found it to be "very forward, with ripe fruit, cassis and vanilla notes...very complex and long." Another person found some "tobacco and vegetal tones...this had the best fragrance and it's smooth on the finish with some ripe cherry fruit." One participant felt "since it's so approachable now, it's probably not very cellar-worthy." Someone said "This has a huge nose, but it's not as attractive on the palate." I found the fragrances here to be most enchanting! There's plenty of sweet fruit and sweet wood with vanillin dominating. Very showy. There are hints of mocha to the flavors, with sweet fruit, ripe berries and plums and a modest amount of tannin. Quite nice now. Two stars. 1st Place: GIANNI PAOLETTI 1999 "NON PLUS ULTRA"
"This wine has a cashmere texture," said one critic, finding "oak-laced, chocolatey notes with black fruits and a subtle mineral note." A few critics said it had "too much oak," "it's bitter" and "it was macerated for too long a time period on the skins." But another person found this to have "nice aromas and subtle tannins...it's quite cellar-worthy." One taster said "It's an oak monster, but it has tons of fruit to go with the wood." Someone else asserted "This has lots of stuffing and just the right tannic balance." I found the fragrances darned close to perfect! It's got deep Cabernet fruit on the nose and plenty of oak to frame it all. The wine is rich and intense on the palate, with ripe plum and black cherry fruit along with some cocoa notes and cedary oak. Very fine! Two-and-a-half stars.